Data Display used Christie MicroTiles for the "CNN Heroes: An All-Star Tribute,” awards ceremony, held December 6th at the American Museum of Natural History in New York City. The 256-square-foot MicroTiles wall, staged by Data Display Audio Visual, a division of ON Event Services, captured the evening’s festivities and served as the visual backdrop for photos, graphics and video to the live New York audience and millions of television viewers during the broadcast. Christie MicroTiles display at "CNN Heroes." 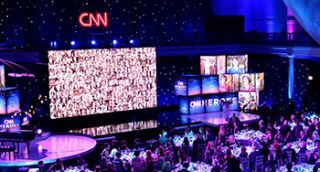 CNN Heroes, now in its ninth year, celebrates individuals who are making contributions to help improve the lives of others. During the awards ceremony celebrities including Sharon Stone, Kelly Ripa and Neil Patrick Harris introduced the honorees, with the 2015 winner – Maggie Doyne – capturing the top prize for her work in building the Kopila Valley Children’s Home in Nepal. “The main reason CNN used MicroTiles is that for the last awards show they used a 5-by-5 array of 60-inch LCD displays to create a video wall, and apparently it was a big challenge to match things up properly so the installation was very tricky,” said Mark Swanson, technology director of Data Display. This year they decided to go with something that would be easier to install and more visually appealing for TV viewers. “CNN developed the content and we created four MicroTiles walls, each with 1920 x 1080 content, and stitched them together to make one huge 12 foot by 21 foot wall, to deliver the 4K content across the whole thing,” Swanson added. CNN sent Data Display the signal from their production truck. Swanson said he dialed back the brightness of the MicroTiles to make them compatible with the set lighting. Having used Christie MicroTiles at two other CNN live broadcasts in 2015 – October’s Democratic Party presidential debate and the Republican Party presidential debate in December – both Swanson and Shawn Rockefeller, vice president of data display, said the MicroTiles have made a impact with their on-camera performance.